The first protocell membranes may have assembled from fatty acids and related single-chain lipids available in the prebiotic environment. At different concentrations, fatty acids can partition between several different phases, including soluble monomers, micelles, and lamellar vesicles, with higher concentrations favoring larger vesicle aggregates. We have exploited this property to show experimentally that evaporation can cause vesicles to grow by increasing the total fatty acid concentration. Rainfall could then cause turbulence and dilution, leading to the division of some vesicles and the dissolution of others. Thus, alternation of evaporation and rain could potentially lead to an environmentally controlled cycle of growth and division. Concentration-driven growth of model protocell membranes. Coupled growth and division of model protocell membranes. 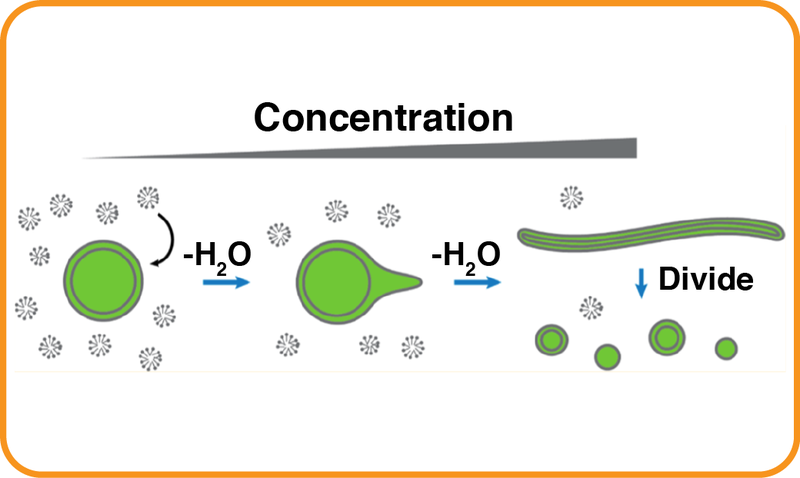 Photochemically driven redox chemistry induces protocell membrane pearling and division. Vesicle growth can also occur as a result of competition between vesicles for limiting fatty acids. Recently we observed that vesicles that contain some phospholipid grow at the expense of vesicles that contain less phospholipid, suggesting the potential for an evolutionary arms race leading to the synthesis of ever increasing levels of phospholipid. 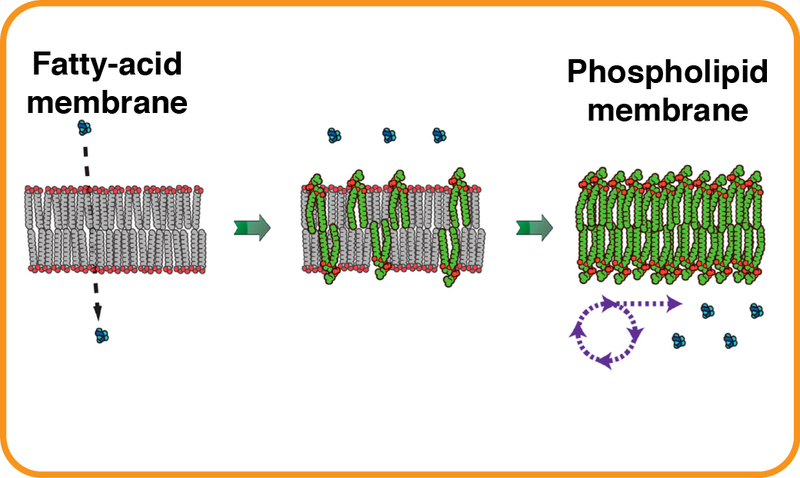 Since this would eventually lead to altered membrane properties including decreased permeability, it is possible that the evolution of phospholipid synthesis set the stage for such downstream events as the evolution of metabolism and membrane transport machinery. Physical effects underlying the transition from primitive to modern cell membranes. For many years there appeared to be a fundamental incompatibility between RNA replication, which requires high levels of Mg2+, and fatty acid membranes, which are destroyed by moderate levels of Mg2+. However, we recently found that when Mg2+ ions are chelated by citrate, membranes are protected but RNA copying can still proceed. This allowed us to carry out RNA-copying reactions within fatty acid vesicles by adding activated nucleotides to the outside of vesicles that contained encapsulated primer-template complexes. In addition to being a major step toward the synthesis of a complete protocell, this experiment is significant because it shows that early protocells could have been heterotrophs that grew by taking up nutrients such as nucleotides that were synthesized in the external environment. Copying of Mixed-Sequence RNA Templates inside Model Protocells.